The decline of the Old Kingdom is often said to have been caused by the long reign of Pepi II, during which the king supposedly lost more and more power to the central administration and the provincial governors. Perhaps the long reign of the king, which had started in his childhood and ended when he was at least well into his nineties, may indeed have allowed the central administration to become more powerful. This, however, does not explain why the central government itself apparently had lost its control over the provinces and the provincial governors. It were these provincial governors, also known as nomarchs, who were a key factor in the decline of the Old Kingdom. It is more likely that climatic changes, resulting in a decrease of the Nile's inundation, impacted the Ancient Egyptian society. As the central government was unable to cope with the results of this change, it was up to provincial governors and other local rulers to come up with a solution to best irrigate their own territory. This, along with different geographical circumstances, caused some provinces and territories to be more successful in controlling the floods than others. While some local rulers still officially recognised the central government in Memphis and the kings of the 7th/8th Dynasty, others proclaimed themselves kings in their own right. Particularly at Heracleapolis, a city located to the south of the Fayum oasis, the nomarchs were successful in founding their own dynasty, the 9th/10th Dynasty, and claiming royal prerogatives. Their influence extended at least as far south as Abydos and Dendara, where it was challenged by the local rulers of Thebes, in Middle Egypt, who founded the 11th Dynasty. Less powerful nomarchs, while having some degree of independence, were loyal to either the Heracleopolitan or the Theban dynasties. The two rivalling dynasties would wage their conflict on both a diplomatic and a military platform, plunging at least part of the country into a civil war. 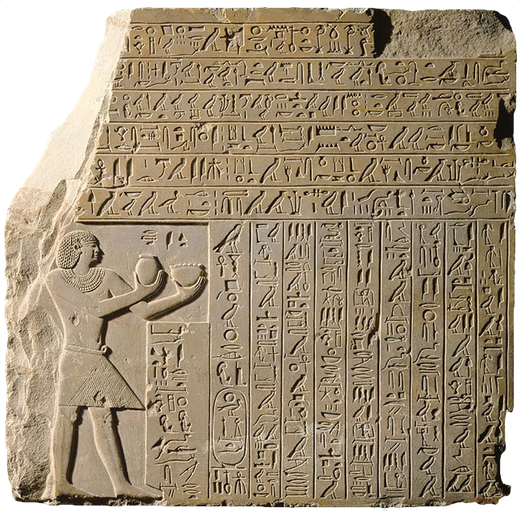 The final victory of the Theban dynasty, led by Mentuhotep II, marked the beginning of a new era of unity and prosperity: the Middle Kingdom. That not the entire country was afflicted by this civil war is, however, shown, at the Dakhla oasis, to the west of the Nile Valley. The capital of this region, known today as Balat, was rebuilt after a fire at the end of the 6th Dynasty, but contrary to the older city, the new capital was not protected by an enclosure wall. At least in this part of the Egyptian territories, there must have been a feeling of security during the 1st Intermediate Period. The collapse of the central government and the break-down of the country into several semi-independent and independent provinces also had consequences on an artistic level. Without the support of the central government, the ateliers at Memphis were no longer capable of producing the high-quality artefacts and decoration they were used to. The local governors chose to use their own ateliers with craftsmen lacking the the required training and skills. The reliefs and statues that were created during this period often lack the refinement of their Old Kingdom predecessors: the craftsmanship was rather clumsy or even sloppy and figures were stiff and dis-proportionate. 11th Dynasty king Antef II from Thebes presents an offering. On the other hand, the 1st Intermediate Period also marks a wider spread of the Pharaonic culture throughout the country. 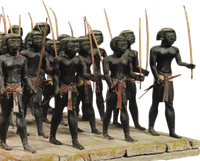 During the Early Dynastic Period and the Old Kingdom, the typical Pharaonic culture had been limited to the royal court and the elite surrounding it. The 6th Dynasty policy of using local governors to increase the hold of the central government on the entire country started a process that would establish the Pharaonic culture beyond the royal court. The increased power of the nomarchs during the 1st Intermediate Period continued and solidified this process, ensuring that the Pharaonic culture would survive the decline of the Old Kingdom.